Of course, regulations differ from country to country. So, rather than provide a complete list of everything that needs to be done to create an ethical pharma exhibition stand, here are some quick things to be aware of. Welcome packs and bags are a key feature at most tradeshows. With notepads, pens and pencils still passed to conference organisers by exhibitors to pop in the pack. However, for many industries such as pharmaceuticals and healthcare, while you can hand out pens and the like, you must make sure that any branding meets the relevant regulations. For example, items must not bear the name of any medicine or any information about medicine.With strict restrictions on branding, exhibitors have to think smarter about how to get noticed. And, with years of experience helping our clients to do just that, we can help you devise some clever ways to boost your brand recognition while remaining compliant. Visitors love a good giveaway at tradeshows. However, many industries including pharma, have strict regulations on what companies can and cannot give away at exhibition stands. For example, at any one meeting, an individual health professional might only be able to receive branded gifts to a token value. And, it can be difficult for a company to come up with desirable gifts to hand out at an exhibition stand while ensuring that this limit is not exceeded.Furthermore, if the show is likely to attract overseas delegates, be careful about giving them freebies that are not allowed on aircraft hand luggage (e.g. liquids, sharp objects, etc. )At Apex, our exhibition team has come up with a huge range of alternative and cost-effective gifts to help our clients to stand out from the crowd. From tasty food and drink, to handy phone chargers and even care packages for busy visitors who have been on their feet all day. The ultimate aim of the pharma exhibition stand is to raise brand awareness and attract new customers. And to do that, passing on knowledge remains the most important giveaway.In most industries, distributing promotional and educational information from exhibition stands is usually allowed. But here again, there might be restrictions on the way this information is passed on. For example, the fact that a memory stick includes promotional material might have to be made clear to the recipient. Likewise, in pharma, memory sticks should not bear the name of any medicine.Rather than worrying about how to distribute information within the regulations, it pays to use your exhibition stand as a catalyst for knowledge sharing. For example, you could integrate tablets, dynamic displays, screens and even virtual or augmented reality into your exhibition stand to disseminate information. RFID (radio-frequency identification) technology can also be used to guide visitors around a pharma exhibition stand, creating an interactive and informative journey that enhances their overall experience. Clever tech such as gamification and competitions are a great way to grab attention, attract footfall, and start relevant conversations (both with your business and between other visitors). But there might be strict rules in place about how you use quizzes at your tradeshows. For example, if a pharmaceutical company wanted to use an interactive tool that required an attendee to make a series of choices regarding a treatment pathway, this might be considered a quiz rather than educational material. Expert advice can help to keep you compliant and devise something engaging that doesn’t break the rules. Serving food and drink is another common way to attract visitors to your exhibition stand and capitalise on this opportunity to start conversations. And while there is no reason that most industries would not allow this to be offered, there are often limits on what can be provided.For example, in the pharma industry hospitality provided from an exhibition stand might be allowed for subsistence but not if it was designed to induce a delegate to visit the stand.Here again, you can still use exciting features to draw attendees to you and keep visitors coming back. But you must understand the parameters you have to work in. Data can be used to enhance your business intelligence functions, leading to more complete customer profiles, better insights and analysis, and more detailed sales reporting. So it makes sense that you’d want to use your exhibition experience to collect as much of it as possible.But, it is essential that any data you collect in return for providing information (e.g. email addresses) meets the relevant industry and legal regulations. For example, in response to the rapid growth of technology, the GDPR has significantly modified the way we can collect, store and use personal data. And, ensuring compliance could be a minefield for even the most seasoned of event professionals. ‘Green’ issues are no longer niche. Customers across industries expect your brand to be committed to sustainability, and to be able to demonstrate this commitment wherever possible occasion.To cut down on paper, use software designed to eradicate printed marketing at exhibitions by sharing files and documents digitally. For example, at Apex we use an award-winning Digital Literature System. Where you do have to create hard copies, use double-sided printing wherever possible or create reusable formats that aren’t event specific.You should also consider creating easily transportable and reusable display materials. Talk to Apex about flexible, modular kits (or freestanding sections) that are easy to set up, reconfigure, pack down to store and transport. In addition, all our aluminium hardware can eventually be recycled. 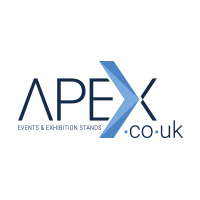 At Apex, as well as creating eye-catching ethical pharma exhibition stands, we also keep you compliant, remove the stress, boost footfall and make your tradeshows a success. To find out more contact us today, or give us a call on + 44 (0)1625 429370 to discuss your requirements in more depth.